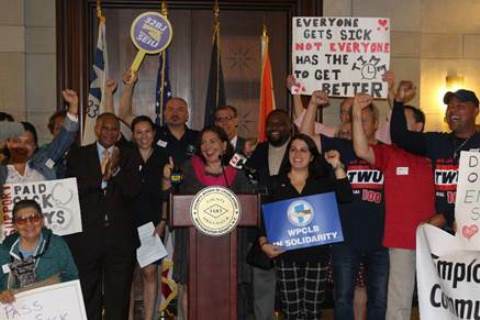 White Plains, NY — Workers in Westchester County who don’t get sick days off at work will soon be entitled to earn sick time on their jobs, thanks to a measure passed Monday night by the County Board of Legislators. Under the measure, workers can earn one hour of sick time for every 30 hours worked, up to 40 hours per year. The law doesn't limit the amount of sick time an employer may offer employees, but will cover the more than one-third of workers in Westchester who currently lack any paid sick time, and who may face retribution on their jobs if they take time off for illness. Majority Whip MaryJane Shimsky (D - Ardsley, Dobbs Ferry, Edgemont, Hartsdale, Hastings-on-Hudson, Irvington) said, “Fundamentally it's a pro-worker bill and a pro-family bill and even a pro-business bill, because it's a good public health bill. If someone is carrying a contageous diseases and is forced to come to work, the co-workers are more likely to become sick and the customers are more likely to become sick." At a press event Monday afternoon, ahead of the evening vote, Sarah Leberstein, senior staff attorney and workplace justice coordinator for Make the Road New York, told the story of one woman who came to the group. "[She] wasn't allowed to take time off from her job at a dry cleaning business in Tarrytown either to go to pre-natal appointments when she was pregnant or medical appointments for any of her own kids and if she missed even a couple hours of work to go see a doctor, the owner of the business refused to pay her for the entire day of work," Leberstein said. Under the newly passed measure, sick time will be paid at businesses with five or more employees, but may be unpaid as smaller businesses. Sick time may be taken for a workers’ own illness or to care for an ill family member. There are different thresholds for domestic workers who will earn a minimum of one hour of sick time for every seven days worked, in addition to the one day of rest provided for under state law. There is also a procedure in the law for filing a complaint with the County’s Department of Consumer Protection.